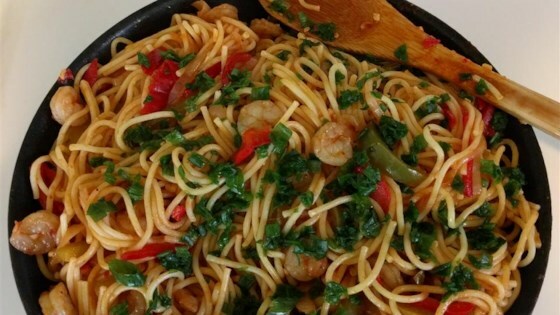 Recipe by: Maurice Tate, Jr.
"This is a Cajun spicy sauce with shrimp that tastes great over a plate of spaghetti. Add as much or as little heat as you can stand!" In a 4 to 6 quart pot over medium heat, mix 4 ounces oil, tomato sauce, 8 to 12 ounces water, basil, 1/2 teaspoon ground black pepper, 1/2 teaspoon crushed red pepper flakes and 1/2 teaspoon salt. Reduce heat to medium-low after reaching a boil; stir occasionally. Season shrimp with 1/2 teaspoon salt, 1/2 teaspoon ground black pepper and 1/2 teaspoon crushed red pepper flakes; mix thoroughly and reserve. In a medium saucepan over medium-high heat, warm 1 ounce oil and add green bell pepper, red bell pepper, onion and garlic for 3 to 5 minutes; stir occasionally. Add vegetables to tomato sauce and cook over medium heat. After 3 minutes reduce heat to low and cook for 20 to 25 minutes; stir occasionally. When sauce has approximately 7 to 10 minutes to cook until completion, add seasoned shrimp to sauce; mix well. Bring heat to medium and stir occasionally. In a small dish, mix cornstarch and 1 ounce cold water; add mixture to sauce when sauce has 2 minutes left until completion and mix well. Pour sauce over pasta and sprinkle with green onions; serve. This recipe is easy and delicious! I wanted it again the next day!! THis dish was absolutely delicious!!! I made it for some friends in my one burner studio kitchen and it was so easy and very very tasty. Definitely a keeper!